GM Caruana had to finish with clear first in the last stage of Grand Prix in order to surpass Shakhriyar Mamedyarov in overall standings and to qualify to the Candidates. Italian, quite surprisingly, preferred an easy draw in the encounter against Leinier Dominguez. 13...Rc8?! Taking into account tournament situation the move was quite strange. There was and the rook even looks better in some variants. 14.Bxb5 axb5 15.Nxb5 Qc6?! Here Caruana could avoid repetition: 15...Qd8! 16.Qa7 It's not rulled out that Italian didn't like 16...Bc6? because of 17.Bb6. However correct was 16...0-0! 17.Qxb7 Bxg5 18.Bxg5 Qxg5. Black is without a pawn but with compensationa nd fight. 16.Na7 Qc7? Even here Black could avoid a quick draw! 16...e5 17.Qxe5 Qc7. В случае 18.Qxc7 Rxc7 19.Nb5 Rc8 Black is not any worse. 18.Qd4! was stronger and here black has to find 18...Rb8! But after 18...Rd8 it can still continue the fight. The draw made Caruana entirely dependent on the result of Gelfand - Ponomariov encounter. Only Gelfand's loss could help Italian to take clear first. 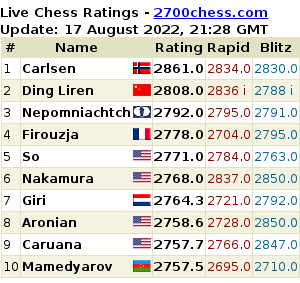 Gelfand drew and joined Caruana at the top of the table. Thus, GM Mamedyarov became second participant of the Candidates qualified from the Grand Prix Series. Veselin Topalov was first. Bulgarian GM Veselin Topalov won the Grand Prix Series with 410 points. 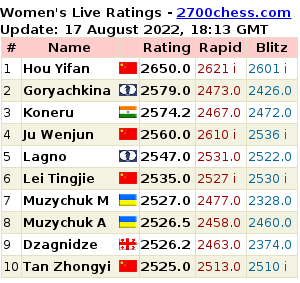 Shakhriyar Mamedyarov, who became the winner of the 5th stage of the Grand Prix which was held in Beijing, is yet second (390 points), however, Alexander Grischuk and Fabiano Caruana have theoretical chances to surpass him. In order to do so they both need to take clear first at the last stage which will take place from September 18th to October 2nd. Shakhriyar Mamedyarov: "I Don't Think Breaking the Grand Prix Series Now Is a Good Idea"